Okay, that sounds dumb, and it probably is, but hey! That's why blondes have more fun! Just logging in is a trek into the unknown for us! Hahhaha. Ahem. Okay. Seriously. This has always been a "gray" area for me, and something that's been on my list of "things I want to know more about*," but I'm now working on a small project where I really need to know this better!! I'm going to explain my current project, because it will show you where I need help. I'm working for Dell, and going to corp client sites where I decommission their Win 7 PCs and install Win 10 PCs. I know. ZZZZZZZZZZzzzzzzzzzzzzzzzzzzzzz. The current client (I'll call them "KN") has provided 4(?) different admin accounts for me to use, plus, I also get the primary user's login info. The local admin accounts are (supposed to be) the same for all machines. The AD domain is "usa.domain.all.kn"
Some actions require me to login as a local admin and some as a domain admin. When I'm logging in, I sometimes see "You are logging in to usa" and sometimes "You are logging in to "usa.domain.all.kn". As I write that, I'm thinking Win 10 is displaying the full domain name, but I don't remember exactly. If it's showing just "usa", do I need to add the full domain name, or is it going to use the full domain name, even though it's displaying only the top level portion? Sometimes, there is no domain listed at all. Nothing. No hostname, either. The username is already shown, "Administrator" and there's just a box for the password with the right arrow. When this is the case, I'm not sure if the admin account is the local or domain one. Is there only one it could be, and if not, is there some way to tell which it is, or do I always have to add the hostname or domain to be certain? Also, when needing to specify the domain or hostname, I've always used the DOMAIN_NAME\account_name or HOSTNAME\account_name format. However, some of the documents show "account_name@DOMAIN_NAME" and I've had to use that format on this project. I *THINK* (yeah, yeah... that's how I get in all this trouble!) this format has worked when the first format hasn't, but again, I didn't specifically confirm this. However, my question is: is there any difference between the two formats or is it just preference? I've got (waaaaaaaaaaay!) more questions, but that's enough for now. Muhahahahahaha!! * yeah, mon.... I really do have a list of things I want to learn. Sadly, I seem to add more crap to it, than I get to check off. Username is created in the local SAM database on the computer. - UPN, User principal name, looks like username@usa.domain.all.kn but could be anything that looks like an email address, well not everything. You can find the correct UPN and pre-windows 2000 name in AD Users and Computers. Username is created in the AD database on the Domain Controller. There is no much difference between the two formats. I think UPN uses the GC to look for the accoutname, but I'm not sure. In any case on the client the Access Token will be generated and filled with the user SID and the SIDs of the groups he/she is member of, and other stuff. The result will (and should) be the same. So I'm bugged out that you can type in just the "USA" in "usa.domain.all.kn" and it would work. You just made my world tilt. Thanks. Now I gotta go get un-sober so things are normal again. Okay. So just to make sure I understand... if I wanted to log on to the domain, I would be able to use either the USA\name or name@usa.domain.all.kn format? Thanks for the education! You have no idea how much I love learning about this stuff!! >> So just to make sure I understand... if I wanted to log on to the domain, I would be able to use either the USA\name or name@usa.domain.all.kn format? Well, maybe I'm a little too fast. 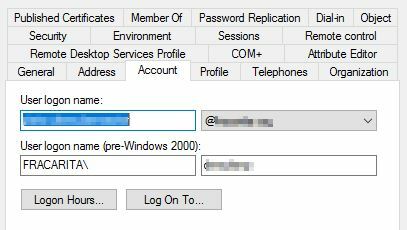 You can login to your domain with either the User Principal Name (AD attribute userPrincipalName) or the pre-windows 2000 Logon name (attribute sAMAccountName) preceded by the Netbios domainname. See screenshot in previous post. I assumed that your UPN is @usa.domain.all.kn and that your Netbios domainname is USA. see also : http://smallcitydesign.com/netbios-name/ or type "set" at the command prompt and look for the variables USERDOMAIN and USERDNSDOMAIN.